If you are looking for a stocking stuffer for a eco-friendly and natural momma, look no further than Seventh Generation's new baby personal care line! Any new mom would be delighted to receive any one of the seven products to put on their little ones. Furthermore, adults love using the lotion and sunscreen on themselves! The line includes Bubble Bath, Shampoo & Wash, Foaming Shampoo & Wash, Diaper Cream, Sunscreen and Body Lotion. This is the first USDA Certified Biobased Baby Care Line on the market today, meaning the products are made from plant-based ingredients versus petroleum-based. Seventh Generation is proud to disclose everything that is in these products, as the products are free from parabens, phthalates and synthetic fragrances, and are some of the safest and most gentle products products moms can find on shelves today, ensuring a happy and health wee one! They also offer chlorine-free diapers that I LOVE to use on my babies! The new biobased certification label discloses the percent of renewable carbon (i.e. natural plant and marine elements) in products versus petroleum (a non-renewable resource). Seventh Generation chooses ingredients that make for a highly natural product with excellent performance. Seventh Generation also follows the precautionary principle, meaning they won’t use an ingredient in their products until they are sure it is safe for consumers. Everything you want in a diaper – and nothing you don't. Bottom-loving, baby-pleasing performance with absolutely no fragrances, latex, petroleum-based lotions or chlorine processing. You'll love the way the new, adjustable tabs give baby a soft and comfortable fit. In celebration of our partnership with Dr. Seuss's The Lorax, Free & Clear Diapers now feature delightful limited-edition character prints. Buy It: You can purchase these Seventh Generation products in prices ranging from $7.99 - $13.99, and they will be available at stores such as Walgreens/Duane Reade, Target and even grocery stores, including Whole Foods. 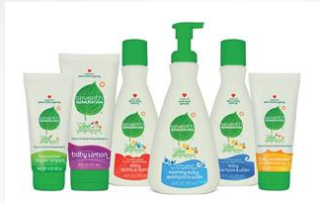 Win It: Seventh Generation is generously offering (3) Personal Care baby products of your choice to a lucky winner!